If you like looking at stars, birds, or even animals in the safari, then having the best zoom binoculars, with a high magnification, is essential. However, these binoculars are usually very expensive because they are meant for those that use the binoculars professionally and not for their hobby which makes it hard for those looking to use the binoculars for hobby purposes as the price isn’t easily affordable. As there are a lot of choices available, there are also great value choices that you can find that will fit your needs. High magnification binoculars are similar in terms of features, but when you are choosing your zoom binoculars, we recommend that you look at the features, quality, and price, as they are the most important things that you should look for to have the best experience possible with the binoculars. These days, there are increasingly more zoom binoculars available, making it harder for you to make a choice, so we compiled a few products below that we reviewed to give you a few recommendations on the ones we think are the best zoom binoculars. With high magnification binoculars, there are a few features that you should try to have on the binoculars that you choose. One feature that we recommend is the stabilization feature, as it will help you incredibly with binoculars with high magnification. As the magnification goes up, the more sensitive your binoculars will be and with stabilization, you won’t have to worry as much about keeping your hand still. We also recommend that you get a binocular with a good focus knob as you will be using it frequently and having a good one will make it so much easier for you when you are changing your magnification a lot to fit the distance between you and your target. Lastly, we recommend that you get multi-coated optics and prisms, so that you can view in the dark without the need for light with clarity and high definition. The optics will also let you focus more light into your binoculars to get better color transmission. The quality is also something that is important if you want to use your binoculars for a long time. This is because the better the quality of your binoculars, the longer the parts will last, making your binoculars last a longer time overall. Also, if the quality of the focus knob, optics, etc, is of high quality, then you will get a better experience because then these parts will work more efficiently. The quality is also important if you are looking for a value purchase because you will be able to experience all the great things about the binocular as well as have it pay for itself repeatedly for a small upfront investment. The price of your binoculars will change the features and quality that you get, just like any other purchase. The more you invest upfront, the better the features and better quality that you get, and vice versa with cheaper products. We highly recommend that you invest a bit more upfront, so that you get more value out of your purchase eventually. This is because you’ll save a lot more money owning a quality binocular for a long time compared to owning several cheap binoculars and having to replace one every time it breaks. Known for the quality in their cameras, this binocular will also offer you the same type of quality and definition that you would expect in a Nikon product. Although this product is a bit pricey, you will get access to high magnification, as well as special optics that will help you get a bright and clear image, anywhere you go. 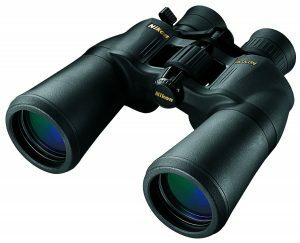 If you are looking for a quality product and your budget is a bit flexible, then we highly recommend that you take a closer look at this Nikon binocular. A feature that we liked about this product was the multi-coated eco-glass lenses because of the advantages that you get with it compared to binoculars without this feature. Without it, you won’t be able to see as easily in the dark because the multi-coated lens help transmit more light into the binoculars, allowing you to see better in dim lighting conditions. Another feature that we liked was the zoom control knob. 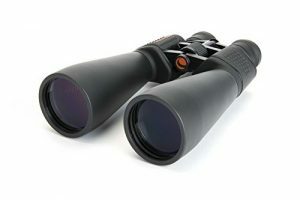 Since you are using a zoom binocular, you will most likely be adjusting the magnification on the binoculars frequently. With this feature, you will be able to do this more easily and with better clarity as well. Lastly, we liked the rubber eye cups that came with the product because it will allow you to adjust the eyecup to fit your eye relief level, so even if you wear glasses, you can use this binocular without any issues. The quality of this binocular is fantastic for a few reasons. One, this binocular comes with rubber armoring, so that your binoculars will be able to survive drops and absorb scratches a lot better. This will allow you to use your binoculars for a longer time which is essential in a pricy product like this one. Second, the design of the binoculars is also beautiful, so if you are one that cares about the looks of the product, then this Nikon binocular is one you should choose. Lastly, the quality of the lens and the focus knobs were also of high quality, as they were made from durable materials that are proven to work well over a long period. The price of this product is a bit on the expensive side. It isn’t the most expensive, but it is in that area, so if you are tight on your budget, you may have to look elsewhere. However, if you can afford this binocular and if it fits inside your budget, then we recommend that you grab it because it will offer you features, quality, and value that you cannot find anywhere else in this price range. With the magnification that this binocular comes in as well as the features that come alongside it, the price of this product should be a lot higher, so the value that you get with this binocular is priceless. Overall, this binocular is recommended if you can afford it and if you are looking towards a quality investment for long term use. 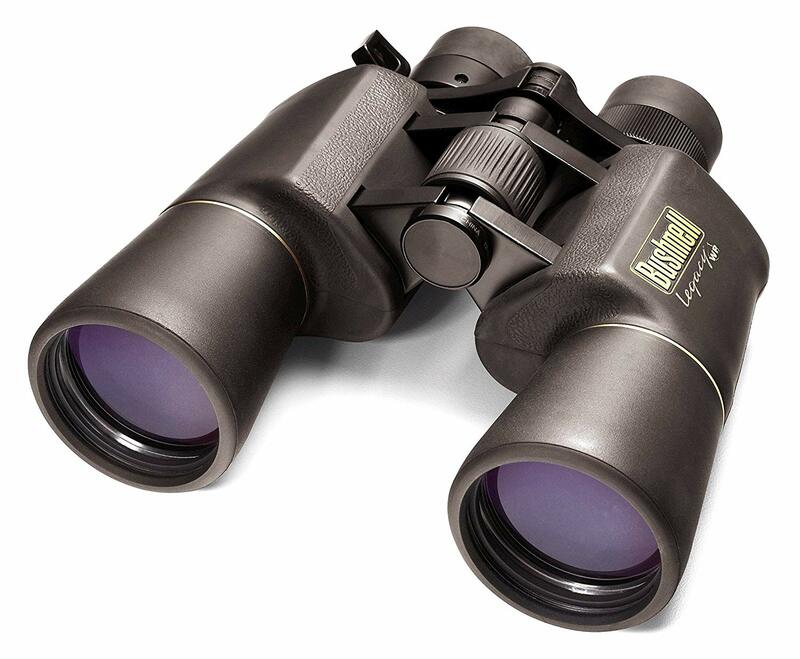 With an amazing design and high magnification, you can’t go wrong the Bushnell Legacy Binoculars. This product is one of the best compact zoom binoculars Bushnell has released, so if you are stuck on a few products, take a closer glance at this one. With adjustable zoom and multi-coated optics, you will not only get a high-quality view, but also one that you can adjust from high magnification to medium magnification, so that you are at the right place at the right time. The feature that we like the most about this product is the prism and multi-coated optics because it is one of the strongest points about this binocular. As the clarity and definition of the view is an important aspect of the Bushnell Legacy, you will be able to see in high definition, even in the dark, due to the multi-coated optics and the BaK-4 prisms. Another feature that we liked was the adjustable zoom feature because not only will you be able to stay at one magnification, but choose one between 10 and 22. So, if you are in a situation where being too close may not be too great, then you can simply zoom out to fit your situation. Lastly, the eye cups were a feature that caught our eye because that means if you wear glasses, you won’t have to suffer the pain as you will be able to adjust the eye relief to match your relief distance. The quality of this product is on the upper side, mainly due to the quality of the optics and the design. 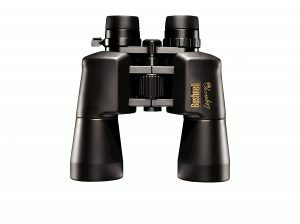 We loved the design of the Bushnell Legacy because it makes your binoculars seem like a very high quality product while having an affordable price tag. All the materials used in this product are of mostly high quality, so if you are interested in a long-term purchase, then this product is something to look forward to, as it is built to last a long time. Alongside the quality materials, this product also comes with rubber armoring to absorb all the shock that may come from drops and scratches. The price of this product is one of the advantages because this binocular is one of the most affordable zoom binoculars that you can find that has all the features that you will want. Although this product has amazing quality and great magnification, it comes at a low price tag, so if you are interested in a budget, quality binocular, this one is the one to go for. This binocular is one of the more affordable zoom binoculars on this list, so we recommend that you take a closer look if you have a tight budget and you cannot afford any of the binoculars above. Although affordable, this binocular has high magnification, quality optics, and plenty of value. If you are an amateur astrologist, then you should get these binoculars because you have access to a tripod adapter as well as high magnification to use on your next astronomy, star gazing trip. Some features that this product comes with includes the night vision feature, the eye relief adjustment feature, and the anti-reflective feature. First, the night vision feature isn’t something that will allow you to see everything in the dark without any light. This feature acts as multi-coated optics which basically helps transmit as much light as possible inside the binoculars to allow you to have a HD view, even in dim environments. The eye relief adjustment is mainly for those that wear glasses, but it can also be beneficial for those that may not fit perfectly in the binoculars and may not fit inside the relief region. Lastly, the anti-reflective feature is great if you are planning to use these binoculars in sunny environments, such as the safari, as light won’t reflect off your binoculars which will help improve your overall experience. The quality of this binocular isn’t the best, but it isn’t something to avoid either. 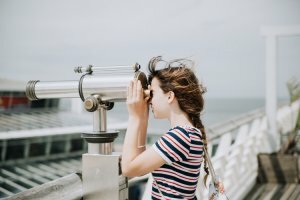 The quality of this binocular is fine for those who are light users and aren’t going to use the binoculars every day as if you don’t drop it often or if you take good care of it, it can last quite some time. A part that isn’t that high quality was the focus knob as it doesn’t feel as premium as the other products in this list. If you are one that takes good care of their equipment, then this purchase won’t be too bad because you’ll be able to use the binoculars long enough to get enough value out of it to pay for itself. The price of this binocular is one of the advantages of this product. With an affordable price tag, this binocular should be accessible to anyone who is interested in a budget binocular with high magnification and tripod support. This binocular is also great if you are an amateur as you won’t be as pressured to not break the binoculars and therefore be stress-free while using it. Overall, we believe the value of this product is worth it due to how affordable it is and because of everything that comes with these binoculars, although the quality may drop in some places. Whether you are going on a trip to visit the mountains or to go bird watching, the best zoom binoculars will come in handy. However, it may not always be great to have a one magnification binocular, since you might come into a situation where you may have too much magnification or too little. For this situation, it is advantageous to have a zoom binocular, as you will be able to adjust the magnification to your needs. 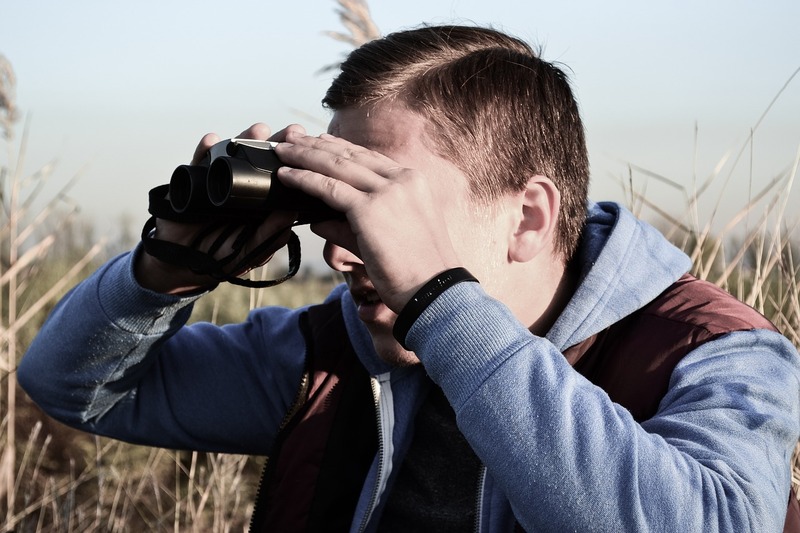 If you are stuck on which one to get, we recommend that you read our reviews of some products above to give you a few ideas as to which one you should choose and what to look out for in a zoom binocular.